On the occasion of completion of three years in power by the Prime Minister Narendra Modi-led government today, the Bharatiya Janata Party (BJP) is counting its positive points whereas the Congress is trying to surround the saffron party on its false promises. Hitting at the Prime Minister, the Congress said that the BJP has spent Rs. 2000 crore on the celebrations, adding that these three years of Modi government can be summed up as 'Bhashan aur aashwaasan, yeh hai mera shaasan'. "The entire focus of the Modi government is only on its publicity. They do not have any concrete policy for the country. Modi government has not done anything in the last three years. 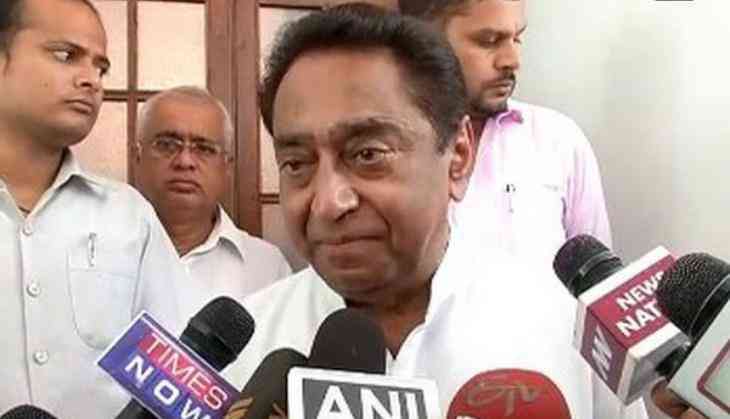 This government has only given attention to the promotion of schemes like Make-in-India, Jandhana and Swachh Bharat Abhiyan," Congress leader Kamal Nath said while addressing media here. He added that millions of rupees have been invested in the promotion of these campaigns, adding the present government should highlight how much black money has returned. "They should tell what the country has got from the demonetization move. In these three years, the conditions of the farmers have deteriorated. Most farmers have committed suicides only during the tenure of Modi government and these farmers have got no benefit from the crop insurance scheme," he asserted. Nath further said that the diversionary tactics used by the BJP of diverting the people's mind is a "Kalakari ki Rajneeti". "With the largest aspirational society on this planet, the youth of the country are looking for employment. We see employment at a 15 year low. With approximately 550 million youngsters in the country, employment has been the lowest in the past seven years," he added. He further said that the Prime Minister during his election campaign promised about two crore jobs a year. "What is the outcome? We see that only 1.35 lakh jobs were created in 2015 and by 2028 India needs to create 34.3 crore jobs and that is not to meet the shortfall but we need to create it to be able to have employment," Nath added. Earlier today, the Prime Minister arrived in Assam and began the celebrations by inaugurating the Sadia Bridge across River Brahamputra in Purana Sadiya. The Prime Minister took to the social media to ask the people their views on completing three years as Government at the Center. "What do you feel about the Govt? Where have we done well & where can we do even better. Join this survey on NM App," Prime Minister Modi tweeted. A central Control Room will be established at the party headquarters in Delhi to coordinate and monitor the mega event that will continue till June 15. All union ministers, BJP's Members of Parliament, chief ministers and deputy chief ministers of the BJP ruled states will take part in the massive exercise to ensure that Prime Minister's message of growth and development reaches every district in the country. Party president Amit Shah will take part in the MODI fest in Kerala, Andaman and Nicobar Islands, Chhattisgarh and Arunachal Pradesh. Union Home Minister Rajnath Singh will attend the events in Jaipur and Mumbai, while External Affairs Minister Sushma Swaraj will be in Delhi and Lucknow. Union Ministers Arun Jaitley will participate in the MODI fest in Bengaluru and Ahmedabad; M. Venkaiah Naidu in Bhuwaneshwar and Chhattisgarh, Nitin Gadkari in Chennai and Ranchi in Jharkhand. The Chief Ministers of the BJP-ruled states will not only take part in the MODI fest in their states but also in other states. Rajasthan Chief Minister Vasundhara Raje will attend functions in Shimla, Himachal Pradesh; Goa Chief Minister Manohar Parrikar in Vijaywada, Andhra Pradesh; Maharashtra Chief Minister Devendra Fadanvis in Kochi, Kerala; Gujarat Chief Minister Vijay Rupani in Hubli, Karnataka; and Uttarakhand Chief Minister Trivendra Singh Rawat in Jammu and Kashmir. #CinemaTales: Can you guess which actress gave Danny Denzongpa his screen name?